A lot of motivation was required for this block. Lots of HST’s and seams galore. The end result was worth it though. One more to go and then the sashing, borders and quilting. « Tuesday’s Treasure – Jasper Carrot and P2 Block 7 finished. If I haven't said it yet, I am Loving where this quilt top is going! These colors are wonderful. I would never have thought to put them together, but you have created a very beautiful and sophisticated quilt using them. Thanks for the inspiration. Gorgeous work. You are so clever. 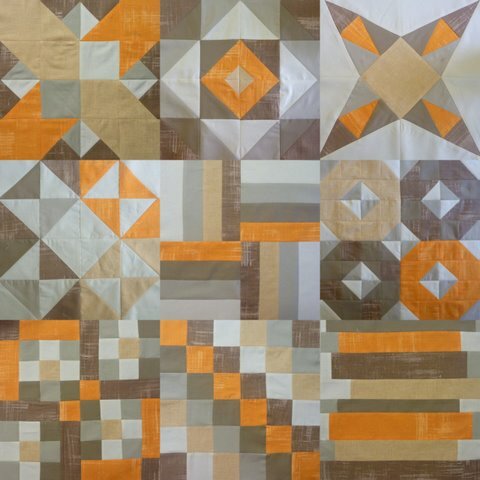 I have been following this quilt with interest and I must say…. the colourway is really growing on me. Can't wait to see it finished. I really like what you are doing. Love the fabric choice. I love your quilt top. Absolutely gorgeous! Can't wait to see it finished.